Do I intend participating in the Lichemaster game? Oh yes! Can I Count Three Points? ... I thought it would be a constructive use of time to start cutting out LBM shield transfers and applying static grass to bases. 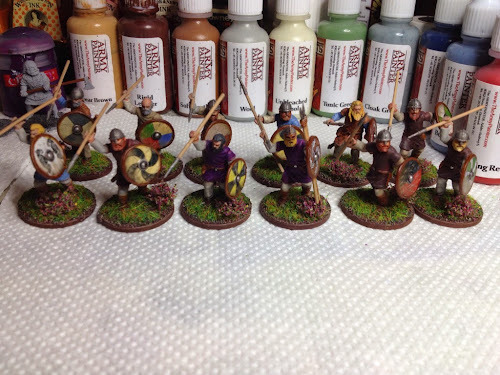 This Norse Gael unit will include 10 Dane Axe armed warriors. The two extra figures will be added to an eight strong unit of metal figures (base coat started on these believe it or not). Shield transfers were added to 13 plastic shields (one spare 'just in case'). Since the figures will all be used for gaming, I've attached the shields to figures using epoxy resin for a firm bond. Since epoxy takes a while to dry, I also used a small spot of superglue to hold each shield in place while the epoxy dried. I repeated my earlier two colour blend when applying static grass. PVA glue (watered down to make it flow into gaps better) is first applied to each base. I have two sheets of paper on the floor with one shade of grass in a plastic applicator on each. The dark shade is applied first, followed by the lighter shade. I then use a make-up 'blusher' brush to gently remove grass from unglued parts of the models. By brushing around the edges of the base upwards, it also helps to make the grass stand erect. A dry paint brush is used to get to fidly parts, especially feet. The two boxes show the vegetation tufts I use for the Norse Gaels. Most figures have heather, but one or two have wild grass instead - for variety. These work a treat and really add character to the figures. When I returned home last night, the glue had dried sufficiently to allow me to touch up the paintwork on the shields. The shield rims are leather, with a sepia ink wash applied. I decided to get this done last night so I can varnish this morning. Although the figures are already varnished, the transfers need a coat of gloss to protect them and prevent future shrinking. Once the gloss has fully dried (probably Sunday), I will apply a final coat of matt to remove the glossy shine. And then they are done! twenty four figures completed representing three points of warriors. Next up are more Dane Axe warriors, but we are now talking metal. Stay tuned! This isn't a battle report, but I thought I'd post my thoughts on Saracens after playing against them for the first time Wednesday night in Rochester. No photos alas. My opponent was Omer and we played at Rochester Games and Models. This is a really great shop that has whole heaps of stock for a diverse range of wargames etc. There was definitely a lot of gambling going on with the Saracen battleboard and it seemed to me that the gambles failed more than they came off. The ability of Omens in particular made us both laugh, especially when sixes were rolled on a bet of a sword or crescent! It was the first time either of us had played with Saracens so still lots to learn. Definitely fun to play and a big thanks to Omer for a very enjoyable game. As for the Norse Gaels, well a bunch of Dane axe warriors is nearly finished. They are even varnished! Hoping to get the bases and shields completed over the weekend. I'm playing Space Hulk tomorrow night at the Friday Night Firefight Club, so no more painting until Saturday. Stop Throwing Those Bloody Spears at Me! 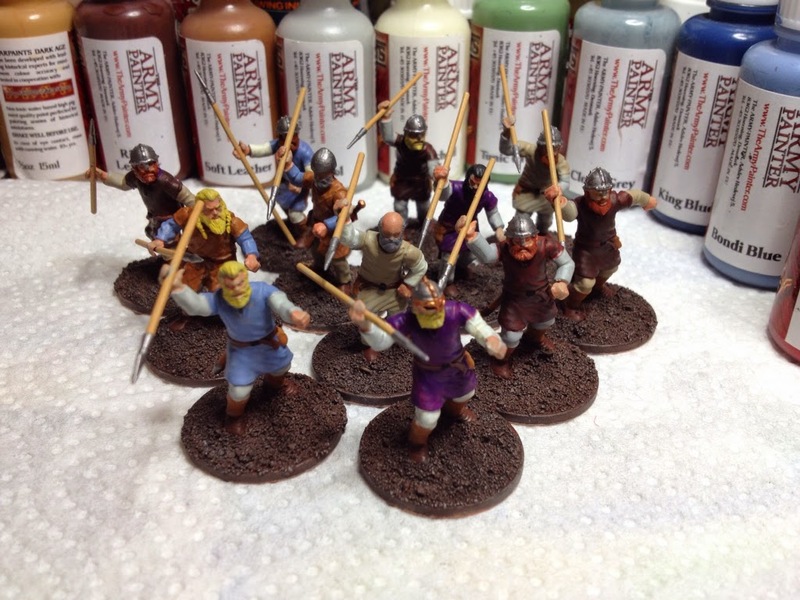 Here we go, the first fully painted unit of Norse Gael - 12 javelin armed warriors. 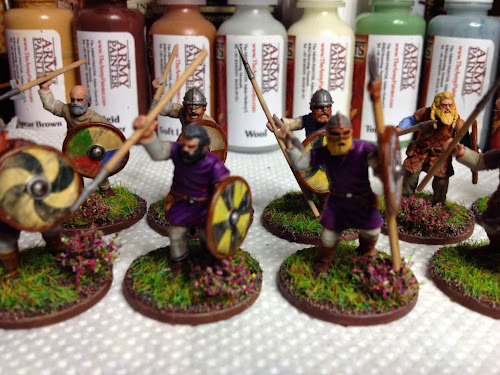 These are made up from a mix of Gripping Beast's Dark Age Warriors and Wargames Factory Viking Bondi. All figures are plastic and shield transfers are once again by Little Big Men. I'm not a great fan of plastic figures, detail tends to be a bit 'soft' and I find them a bit of a challenge to paint (if you'll excuse the Norse Gael pun). But at least they are relatively cheap and can be assembled in lots of different poses. I've had a rethink about bases and decided to mix static grass with tufts (or heather in this case). I used two diffent shades of grass, with a darker blend applied first and the lighter grass applied over the top. I'm quite pleased with the effect and am now considering redoing my Anglo Danes in a similar way (with grass tufts rather than heather of course). Next up are more plastic warriors, this time with Dane Axes. These are also approaching completion and more photos will follow soon. Lids have been opened, cans sprayed and brushes, er, brushed. They are not finished yet, but a start has been made on the Norse Gaels! The whole warband has now been under coated. After reading some comments on a web forum, I decided to try a different primer. I prefer to undercoat figures grey and until now have used Plasticote (or something) from the local craft shop. It's ok, but does tend to gum up and after painting the Anglo Danes I'm convinced it leaves a grainy surface. 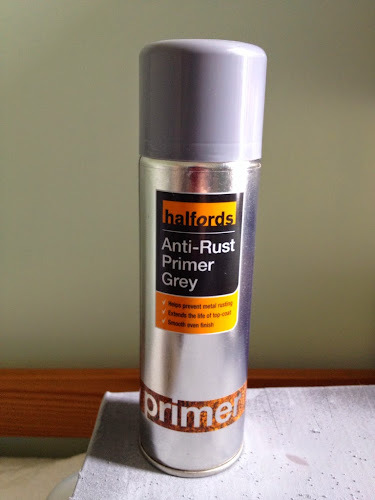 Anyway after a bit of research I decided to buy a can of primer from Halfords. It's early days but the spray appears to cover figures very evenly and leaves a nice smooth surface for painting. 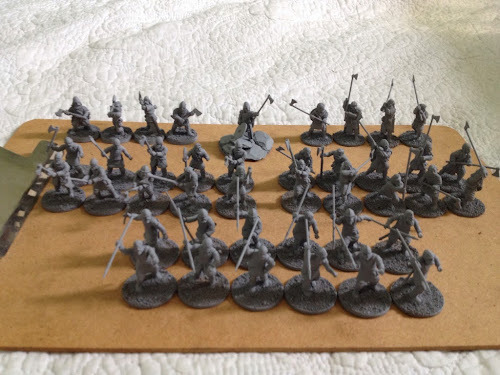 The first lot of figures I'm tackling are Norse Gael warriors, armed with javelins - 12 of them. These are all plastic figures and the base coat is now complete. Washes and highlights will be applied hopefully later today. These warriors will also have shields, but these are being painted separately. On a different note I recently had a really great game of SAGA at the Friday Night Firefight Club. My Anglo Danes faced Adam's nasty Normans. It was a close game of Clash of Warlords with the Normans slightly ahead on points until the last turn of the game. My warlord with huscarls then cleared away a unit of crossbow armed warriors to leave the Norman warlord all alone. Fourteen attack dice later and it was all over. One interesting thing about this game was the impact of the new terrain rules on the Norman cavalry. In short, don't charge horse mounted troops into uneven ground! The fatigue mounted very quickly on Adam's warriors and after a clash with my levy, they became exhausted and I was able to eliminate the two surviving warriors using the Anglo Dane Exhausted battle board ability. We didn't think that this rule change unbalanced the game in any way, but I'm sure it will affect how other warbands deploy cavalry.